all around the world,they have indeed made a lot of money from running churches as they are the spiritual leaders to millions of faithful pentecostal christian members all over the world. Apart from superseding and handling the affairs of the church,these pastors also have some other successful side businesses that add more money to their total net worth. In this article we will quickly check out the list of the current Top 10 Richest Pastors In the world this year,you should also note that Nigeria has the highest number of the richest pastors in the world,5 out of 10 richest pastors in the world are Nigerian pastors. David Oyedepo is one of the most famous preachers in Nigeria,he is the founder of Winners Chapel also known as Living Faith Church World Wide. Currently he is rated as the wealthiest pastor in the world with the estimated net worth of about $150 million dollars. Papa as he is fondly called by his members has more than 3 private jets,he also has landed properties in the USA and UK. He is also the owner of Covenant University and two other universities,plus a media publishing house and other investments,he is an architect by profession. Papa has over 14,000 church branches in Nigeria only and also in different cities in the world,he is currently rated as the richest pastor in the world. The charismatic american pastor is popular around the world,he is still regarded as the richest pastor in the world by some people,it was published that he lives in a house worth more than $1.5 Million USD. T. D Jakes is no doubt one of America's favorite pastor,he makes his money from his tapes and books that are sold all around the world,he has also graced the cover page of TIME magazine. His non denominational american mega church that is located in Dallas,Texas is called The Potter's House,his church has over 30,000 members. It's said that Thomas Dexter Jakes wears a diamond ring that is the size of a coin and wears a $40,000 suit. In 2017 T. D Jakes said that he traced his routes back to the Igbo tribe in Nigeria,he disclosed that his ancestors were probably from Nigeria. It's not often that you get to see a pastor listed alongside powerful world politicians,this was the scenario back in 2009 when Pastor E. A Adeboye was listed alongside the former french president Nicolas Sarkozy and former US president Barack Obama as one of the top 50 global power elites. Pastor Adeboye is the head of the Redeemed Christian Church of God (RCCG) for more than 28 years. It is said that he is one of the most influential pastors in the world,having been linked to some popular notable political figures. He is estimated to have a net worth of over $60 Million dollars. In recent times,he has been called out on social media due to some of his belief and teachings about ''tithes''. The renowned Israeli evangelist is popular for his regular broadcast on television called "This Is Your Day" and his worldwide miracle crusades,he is estimated to have a current net worth of over $45 million USD. Benny is also reported to have a private jet (Gulfstream G4) and some other luxury possessions. Chris Oyakhilome is the founder of Believers Loveworld Ministries also known as Christ Embassy. He has a net worth of over $50 million dollars,his church is attended by over 40,000 members around the world. The pastor makes money from magazine and book sales, satellite TV, real estate Etc,his television channels attract up to 2.5 million views each day from around the world. He is the founder of World Changers Church International,and just like his name,he sure has a way of attracting 'dollars' because he is listed as one of the richest pastor in the world with a net worth estimated to be above $30 Million dollars. His church is located in Futon, Georgia USA,he also has some other businesses such as a record label named "arrow records''. He drives a Rolls Royce and has a multi-million dollar estate. Kenneth Copeland is the founder of Kenneth Copeland Ministries. His church is located on a massive 1,500 acre campus which contains a private airstrip,a hangar,a jet and a lake front mansion valued at over $5 million dollars. He also owns and runs a program called "Believers Voice of Victory''. The late Billy Graham was said to be ''America's Pastor''. He was born in 1918,and has conducted many evangelistic crusades around the world teaching the Gospel. Billy Graham's ministry is said to be worth more than $25 million dollars. He has visited more countries than any other evangelist and his ministry has a program that reaches out to billions of people in over 30 countries. Billy has won different awards and accolades during his lifetime,he was frequently honored by surveys some of which includes "Greatest Living American" and ''the most admired persons in the US and the world''. After death he became the 4th private citizen in American history to lie in honor at the US Capitol rotunda in Washington, D.C. He was the first religious leader to be honored. Another Nigerian on this list is Matthew Ashimolowo,he is the owner of Kingsway International Christian Centre (KICC) in London. His church is estimated to have a net worth of over $20 million dollars. He began his ministry as a pastor in Foursquare Gospel Church,before his church decided to send him to London to open and head a branch there,however mathew had another plans of his own,he went ahead and founded his own church which has now become the largest Pentecostal church in the United Kingdom. It's reported that Pastor Ashimolowo has investments in real estate and also owns a media company. He might not be among the top 3 richest pastors in the world but he is indeed one of the most popular pastors in the world. TB Joshua is estimated to have a net worth of over 20 million dollars. His church The Synagogue Church Of All Nations (SCOAN) attract people from different countries,most especially Africans from African countries,his church in Lagos accommodate over 15,000 worshipers every sundays,with his live television broadcast viewed all around the world. 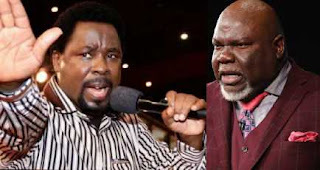 Pastor T.B Joshua’s is also known for his philanthropic donations and miracles. The controversial pastor has over 1.5 million Facebook fans,he is also among the elite pastors that own a private jet. Apart from His live television broadcast,his messages are listened to in many countries of the world.